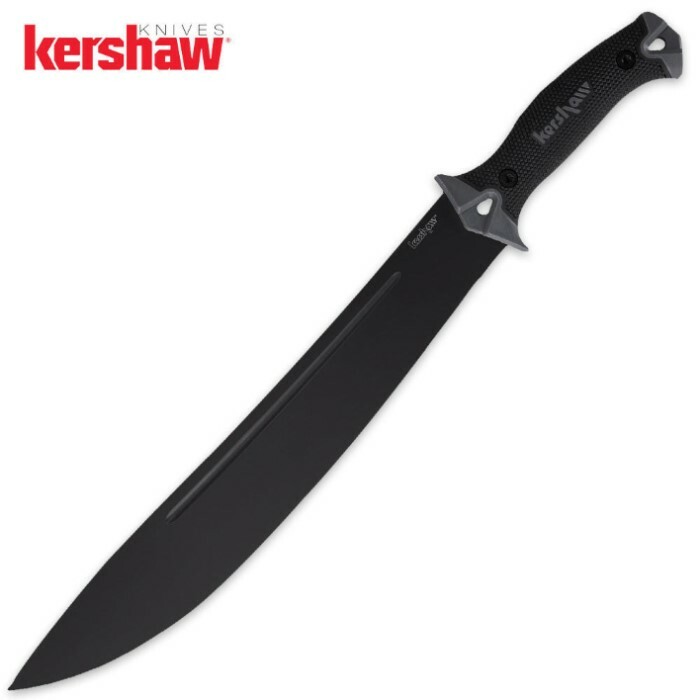 Kershaw Camp 14 | BUDK.com - Knives & Swords At The Lowest Prices! Sometimes, bigger is better. It all depends on the job. That's why Kershaw makes the Camp series knives in three sizes. This one is the Camp 14. This knife does a pretty awesome job of whacking campsite and other outdoor chores down to size in very short order. THIS KNIFE PROBABLY DESERVES FIVE STARS BUT I CONSIDER FOUR STARS FOR A "WORKING KNIFE" TO BE BETTER THAN MOST WILL NEED. THIS IS NOT A CUSTOM HAND MADE BLADE BUT IT IS A VERY USEFUL AND PRACTICAL KNIFE FOR MOST CUTTING AND SURVIVAL WORK AND IN A PINCH WOULD MAKE AN ADEQUATE WEAPON SO WHAT MORE COULD YOU ASK FOR AT A GOOD PRICE. I THINK THE HANDLE IS A GOOD SIZE FOR SMALL OR MEDIUM HANDS BUT FOR LARGE HANDS OR LONG FINGERS SUCH AS MINE IT'S A LITTLE SMALL IN DIAMETER, HOWEVER, I QUICKLY RESOLVED THAT PROBLEM WITH A FEW FEET OF FRICTION TAPE SUCH AS THAT USED ON TENNIS RACKETS OR HOCKEY STICKS AND IT NOW OFFERS EXCELLENT PURCHASE. THE BLADE DOES RATTLE JUST A LITTLE BIT IN THE VERY NICE HARD SCABBARD WHICH MIGHT BOTHER A NINJA BUT WORKS FOR ME AND THERE ARE NUMEROUS CARRY OPTIONS IN THE ACCOMPANYING BOOKLET. OVERALL THIS IS A NICE SIZE BLADE, LARGER THAN A TYPICAL SHEATH KNIFE BUT EASIER TO HANDLE THAN MOST MACHETES AND I HAVE COME TO APPRECIATE "MEDIUM" SIZE IN ALL THINGS. IT IS MADE IN CHINA WHICH I WOULD NOT HAVE PREFERRED BUT NEITHER WOULD I HAVE PREFERRED PAYING MORE FOR A KNIFE THAT WILL PROBABLY GET A LOT OF HARD USE. I CAN'T SAY ENOUGH FOR KENNESAW CUTLERY AS I HAVE ALWAYS FOUND THEM MOST HELPFUL BEFORE OR AFTER ANY SALE YOU JUST HAVE TO BE CAREFUL GIVEN THEIR LARGE SELECTION TO MAKE SURE OF WHAT YOUR NEEDS ARE BEFORE YOU ORDER. The kershaw camp series is a line of well made camp knives, as l have all 3. Good quality metal, very sturdy and all three came very sharp out of the box. I also just liked the way they looked so l got them. Very nice looking blades. Also they have a very snug fit into their kydex sheaths, no rattle at all. Prepare to be satisfied.